In the fast food biz, you have to chase what the people want, or at least tempt them into wanting something they’ve never even dreamed about. Sometimes that means turning chicken into chips, or adding eight slices of cheese to a Whopper, or… making your burger bun green for some reason? Now, the most iconic fast food chain of them all, McDonald’s, appears to be going after the fried potato and pork fat-lovers among us with its latest concoction: Cheesy Bacon Fries. 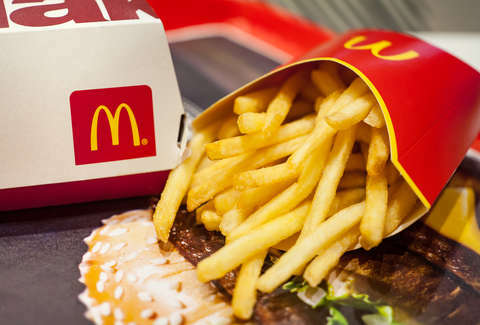 For customers looking for even more ways to devour their calories, Mickey D’s is reportedly planning to add Cheesy Bacon Fries to menus nationwide in early 2019, according to Business Insider. As you might have gleaned from its name, the menu item is basically just regular McDonald’s French fries topped with a cheese sauce and sprinkled with bacon. They apparently also look very similar to the Cheese & Bacon Loaded Fries that are available at the Golden Arches in Australia, per Nation’s Restaurant News. The cheesy pile of carbs actually made its debut at select Stateside McDonald’s locations in Hawaii and Northern California in mid-November, where it was rolled out as a test item, according to BI. Now, the chain is planning to take them nationwide in the early part of the new year, and some locations have apparently already had them added them as an option in their point of sale stations. If you're curious what they look like, a few people who got to try them early in test markets have been sharing photos on social media, and they look like a pretty traditional version of cheese fries topped with bacon. When reached by Thrillist, a McDonald’s spokesperson would neither confirm nor comment on the news, but did say that its “kitchens are bacon-ing something together,” so, ya’ know, it’s probably happening. Until then, you’ll have to settle for plain ol' bacon- and cheese-less fries.